Thailand’s lèse majeste laws have been “used as a repressive tool to deprive the right to freedom of expression,” writes imprisoned labour activist Somyot Pruksakasemsuk. Here is Somyot’s latest letter written from the Bangkok Remand Prison. 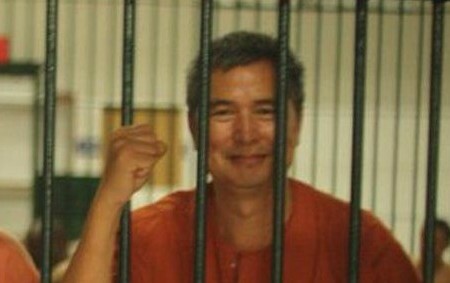 I have been detained at the Bangkok Remand Prison since April 30, 2011 for violating Section 112 of the Penal Code. I wish to express my gratitude to those concerned both internationally as well as domestically regarding their demand upon the Thai government to release political prisoners. For more than twenty years, I have been involved in the struggle of Thai workers to ensure that they live with dignity and are free from poverty. Some aspects that I have helped to bring to them have been the right to 90 days maternity leave, the right to work in a safe working environment (1996), social security act (1990). I have also helped with labour issues including employment compensation as well as unemployment benefit (2003). The above mentioned achievements have been a result of the Thai labour movement. It is in my experience that these rights emerge only from a democratic process forth by elections. Military government in the past have always violated workers rights and freedoms. One instance of this is that during the coup of 23 February 1991, the labour leader, Thanong Pho-aan was abducted and made disappeared. State enterprise trade unions were abolished and banned, as well as the collective bargaining agreement of the private sector deteriorated. During the coup of 19 September 2006, the military government amended the labour protection law to legitimize contract labour employment and freeze minimum wages. After the 2006 coup, I began to participate in the pro-democracy movement against movement behind the coup d’état and military junta. I wanted to publish a magazine that strongly criticized the coup. People rallied to form the United Front of Democracy against Dictatorship (UDD), or red shirt movement, which organized demonstrations and rallies, until the Aphisit government used military force to suppress them in May 2010, 91 individuals lost their lives. During this period my magazine was also shut down, and I was arrested and detained at military camp though I have not committed an offence for 21 days. Upon my release, I founded the ‘Red Power’ magazine that strongly criticized the government and its policies. One of the key issues was the government promising to increase minimum wage to 250 Baht but not being able deliver the promise. Red Power also seeks to investigate incidents behind and the causes of the death of the 91 deaths and other causalities. Nevertheless, its printing house was shut down in October 2010. To continue the printing of Red Power, we had to move our base to Cambodia. After the 19 September 2006 coup, a number of activists, journalists and red shirt sympathizers were rounded up and put in jail invoking the lèse majesté law. Foreign journalists were not allowed to exercise their right to freedom of expression and investigative journalism. Individuals detained pending the trials were subject to torture and denied bails depriving their right to self-defence. Three labour activists were accused on violating lèse majesté law. Mr. Giles Ungpakorn and his wife were forced to live in exile in the UK; Junya Yimprasert, director of Thai Labour Campaign is unable to return to Thailand; Somyot Pruksakasemsuk, former director of Centre for Labour Information Service and Training, is currently being detained without bail under lèse majesté. The majority of the Thai population are indoctrinated to believe in “democracy with the King as Head of State” and any individual expressing different views or deemed a threat to the institution are treated as enemies of the state. Red Power is the only platform to enable individuals to express their thoughts and belief among like minded individuals. It was because of this that I was arrested and remanded under lèse majesté. The law has been used as a repressive tool to deprive the right to freedom of expression. In addition, those charged with violating the law are mostly denied bails, an act of which is in breach of international human rights standards. As a political prisoner, the incarceration deprives me of all my rights and liberties. I find my life being wretched to merely “a domesticated animal in a cage”. The physical and mental traumas hurt me gravely. Many fellow political prisoners like me have unnecessarily lost their family life and career. I have been informed by visitors that human rights activists and unionists worldwide have demanded the Royal Thai Government release all political prisoners. Your movement means much to Thai people. It reflects how international community strives to achieve the common goal of forging a peaceful society in which everyone is genuinely entitled to the right to equality, freedom and democracy. I fervently believe in the collective power and solidarity of all labour unions and justice concerned people. Your struggle to demand the release of all political prisoners in Thailand is an initial step toward democratization.